Its time for another update on the eruption in Hawaii. We are at about 50 days since the eruption began, and there does not seem to be an end in sight. Since the last update lava has been pumping out of the main fissure in the Leilani Estates subdivision and forming a river of fast moving pahoehoe lava all the way down to the ocean. When the wind is going in the right direction, residents of a neighborhood where we once lived (when we first moved to Hawaii in 2011) are able to walk close to the river and marvel in its awesomeness. There are some amazing things to see geologically – this lava lava boat phenomenon is awesome. The chunk of lava you see in the photo below is moving down the river of lava. Its not open for tourism, and if you aren’t a resident, you can be arrested for being out there. The Hawaii Civil Defense is understandably concerned about public safety. 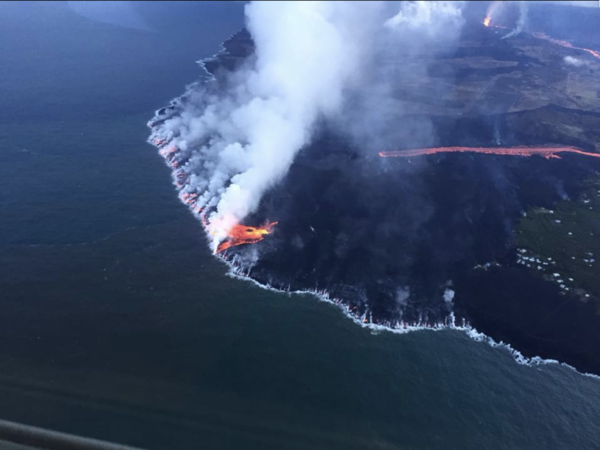 Tourists have been taking a lot of helicopter rides, and boat rides to see the lava where it is entering the ocean. Here is a video of what the ocean entry looked like a few days ago. Sometimes amazing things are seen in the boat – this is a Lavaberg that was caught on video. I am somewhat baffled how this happens. I have a piece of the light reticulite lava collected from Leilani Estates that floats on water, but this is likely a dense block of pahoehoe. I suspect the heat of the rock is great enough to vaporize the water underneath and cause a buoyancy that will last as long as the bubbles keep forming. I would love to have had a chance to observe this until it sunk, or even better observe it with a remote underwater rover! 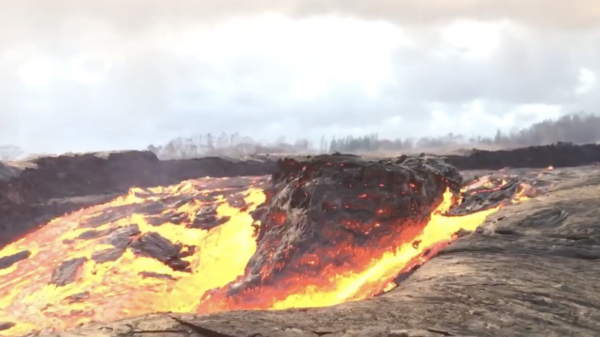 The school where I once taught science, Kua O Ka La, is on the verge of being covered by lava. I met with the school principal last week and we filmed an interview with her and one of the teachers who lives in an area just a mile south of the main eruption. The students I work with in the T3 alliance Upward Bound summer program at UH Hilo are working on building deployable air quality monitoring stations that can report information in real time on a website. Deanna, the preschool teacher in this video has been living in the basement of our home in Hilo since the eruption began. Since this video was recorded, FEMA has changed the classification of her property to uninhabitable and opened up the possibility for her and her husband to receive federal assistance. She and her husband represent the type of families that inhabit much of this area. They own their property outright, and have lovingly worked the land so that they could survive and raise a family on one income. Susie, the principal in the video, had a beautiful home in Leilani Estates that was destroyed by lava. She had paid the high cost of insurance for a home in lava zone one (lava zones are a way that the insurance companies rate risk for lava… 1 is high risk, 5 is the lowest risk) for years only to find out that the insurance company has fine print clause requiring that the owner prove that the home burned before it was covered by lava. Because she doesn’t have a photo of the home on fire she is out of luck. Emily has continued to volunteer as a counselor at the shelters on the weekends and has heard these kinds of stories often. Food and materials are still being provided at the shelters but there is a sense of unease about the future that is gnawing at the community. FEMA and the Red Cross estimate that close to two thousand individuals have been displaced. The lack of housing and the huge economic impacts associated with this eruption are driving out those have the ability to leave. Those that are left are dealing with limited housing options, bleak prospects for work, and the daunting task of dealing with rebuilding their lives with the relatively small allotments that FEMA is able to provide. Heart wrenching stories appear on facebook of small businesses, or individuals that have lost everything and are trying to find what it takes to make their next steps. I am sure that there are even more stories out there that haven’t been written down. When I asked the 17 students in my class this past week how many of them had a direct family connection to someone that had been affected by the eruption, about half raised their hands. They have taken on the task of building these sensors with a vigor that is uncharacteristic of most teens. We met with a chemist at the department of health and they peppered him with questions about air quality and how it can be reliably measured. They helped outline tasks and a timeline and and are diligently working to have a prototype ready for testing early next week. If tests go well, they are preparing to go into production mode and have sensors set up at schools and in communities around the island by the end of the following week. Summarizing the project and educating the public on the meaning of the data with short clear videos will be the task for the last week of the summer program. This is an audacious plan, but its exactly the kind of project that the T3 alliance program was designed for. Funded by a grant from the National Science Foundation, the program teaches students to use emerging technologies to address community based problems. Upward Bound programs receive kits and a curriculum with access to “soft money” that can be allocated as needed. UH Hilo Upward Bound and the T3 alliance program agreed to help with any additional funding needed to make this project work. The air quality sensors are being built with supplies that can be bought at Home Depot and 35 dollar Raspberry Pi’s. With all the sensors and components included, we are looking at something in the range of two hundred dollars. I humbled by the students and the incredibly talented team of instructors that are working on this project with me. We are about to begin posting updates on social media and via the t3alliance.org website as to the progress of the project. Please give their posts a thumbs or a few words of encouragement. With luck their story will inspire other students and to step into their potential roles as engaged problem solvers in their communities. Success here for these kids may mean that they have the efficacy and drive to teach and help others make their world a better place.